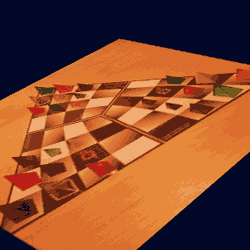 Martian Chess is played on a traditional 8x8 board as opposed to the circular board for Circular Chess. But familiar board aside this variant really does come from a different planet. Each player gets a section of the board that they control for the entire game. In a four player game, each player will get a quadrant. They will start with nine pieces called Icehouse pieces. Three queens, three drones and three pawns. These nine pieces will not stay under the control of the player they start with. They are controlled by the player whose territory they move into. When you move a piece into someone elses quadrant, it is no longer your piece. That piece now belongs to your opponent. Equally any piece that is moved into your territory becomes your piece. The first move is decided by agreement and then continues clockwise. The game ends when one player's territory is empty. At that point each player counts up their points, accumulated by the pieces you've captured during the game. It's three points for each queen you've captured, two points for each drone and one point for each pawn. The player with the most points wins the game. Martian Chess was created by Looney Labs in the 90s. Looney Labs was founded by Andrew and Kristin Looney in 1997. They met while working as engineers at NASA. Perhaps the name of this game has something to do with their passion for outer space. Looney Labs has developed many strategy games. They created what they call Icehouse pieces that they use for their board games including Martian Chess. They were called Icehouse pieces because Icehouse was the first Looney Labs game they were used for. They are actually officially called Looney Pyramids. They have a futuristic, final frontier feel to them. 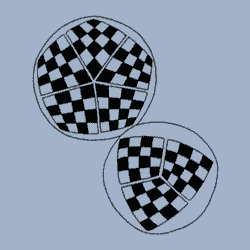 The Looney chess variant is played with these pieces and a number of different game boards, including the traditional 8x8, depending on the number of players. The entire 8x8 chess board is used in a four player game, only half a board for a two player game. For every player in the game there must be 16 squares. Location, rather than piece color, determines which pieces you may move. Each type of piece has its own unique moves. You capture by moving your piece onto an enemy piece's square, replacing it. You can only move pieces sitting in your own quadrant, and only attack those in other quadrants. These may include your own former pieces. The game ends when someone runs out of pieces. 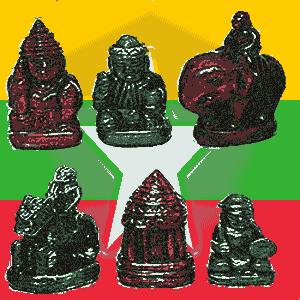 The player who accumulates the most points, calculated by captured pieces, is the winner. Each player starts by setting up nine Looney Pyramids (Icehouse pieces), three of each size, in his quadrant of the board, as shown in the image. The large pieces (queens) may move in any direction, straight or diagonally, with unlimited range. The medium pieces (drones) move only on straight paths (never diagonally) one or two spaces at a time. 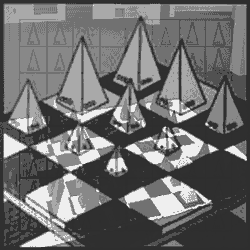 The small pieces (pawns) move one space at a time, diagonally in any direction. No piece can jump over another piece. 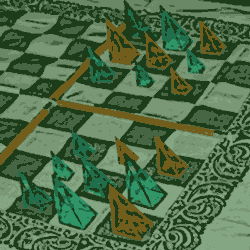 Martian Chess is generally played on a standard 8x8 chess board although variants for 3, 5 or 6 player games are played on boards of varying dimensions. If it is a four player game the entire board is used. Only half of the board is used in a two player game. There are boards of differing design to cater for varying numbers of players. The 64 square board when used for the main variant is split into four 4x4 quadrants. Perpendicular lines called canals intersect in the center to mark these quadrants. Each player will take control of one of these quadrants for the entire game and will have control of any piece that is located in that quadrant. Color is means nothing in this game. The way you know which pieces you control is determined instead by the location of the pieces at any given moment. Any piece in your zone is yours, only you can move it. When you move a piece across a canal, it becomes your opponent's piece. You capture an enemy piece by moving your piece onto its square. Whenever you capture, you give control of your piece to the opponent whose piece you took. To learn more about the various boards try MC Boards. If you don't have any queens, you can merge a drone and pawn to create one. Just move a drone onto the same square as a pawn (or vice versa). Then you simply remove both pieces from the board and replace them with a queen. If you have no drones you can merge two pawns in the same way. The game ends as soon as one player runs out of pieces by emptying his quadrant of the board. A player with only one piece remaining can force the end of the game by moving that piece across a canal. A player may not reject the move of the opponent. If a player moves a piece across the canal, the opponent cannot simply move it back to its original square. If Player 1 moves a queen from square A (in his zone) to square B (in Player 2's zone), Player 2 can't just move it back to square A. He can move it to any other square, but can't simply "reject" Player 1's move. He can move it back to square A later on, because the rule only applies to a pair of sequential moves. The most detailed account of the rules can be found at Looney Labs. Beware of the Double Whammy. When capturing, make sure the piece you used for capturing isn't in a position where it can immediately capture one of your own remaining pieces unless the exchange suits you. Remember the Bottom Line. Keep in mind that the goal is points, not position. There is no checkmate. This is particularly vital in a 4 player game, when 2 people can use the Double Whammy on each other to quickly trade pieces for points. Run For The Border. If you're ahead on points and low on pieces, try to end the game quickly by pushing your last few pieces across a canal. There are some resources online if you would like to try your hand at Martian Chess. Martian Chess is a very original idea. The game play strategy is deeper than what would first appear. You also have completely different strategic ideas if you're playing two vs two. With different board designs created to cater for up to six players, well all I can say is watch your back in that free for all. Watch out as this game can also be kind of addictive. When you get into it, you'll find yourself playing over and over again. Leaving one of the newest chess variants, we'll be heading back to Asia. Now we'll take a look at one of the older members of the chess family. It's Sittuyin from Burma. This link takes you from Martian Chess back to your Homepage. Your Homepage is where you get a site overview. There you can see all of the resources on offer in this web site.